More teeth are lost due to gum disease than tooth decay. Regular visits to our hygienist – Justine Eastwood – at our practice in Preston, will help to improve dental health and prevent Periodontal (gum) disease, bleeding gums and dental decay (caries). Diet advice, fluoride application, fissure sealants and oral hygiene instructions are all part of our programme of prevention with Justine. 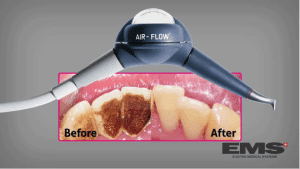 The hygienist surgery is fitted with the very latest equipment including air polishing machines, which gently removes unsightly staining without damaging your teeth. Regular visits to the dentists and hygienist can also solve the problem of bad mouth odour. Advice is also available for the care of your children’s teeth. Justine is also full trained to look after the periondotal (gum) condition of patients with dental implants. Scaling and Polishing: removal of plaque (soft deposits) and calculus (hard deposits) from your teeth. 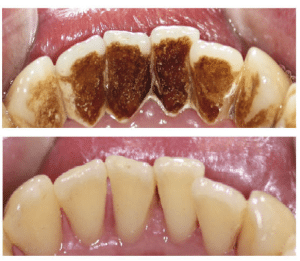 As you can see from these images, the teeth were really bad on the back, and after the air flow treatment, as you can see on the after images, the results are astounding. Evenings and weekends: available on request (please enquire). Our implant service is second to none.